Tuna Tartare Amuse Bouche with ginger jelly. Beautiful~! Note: I have a tendency to procrastinate on writing time-sensitive posts which end up being irrelevant after the time window passes, so this upcoming Boston Restaurant Week presents a good opportunity to revive expired posts from the back burner! I'll start this revival by sharing what I ate for Summer RW 2011. Everyone knows how much I adore Radius, but this occasion was extra special cos Mum was in town to visit and incidentally, RW corresponds with her birthday! I made a note to my hostess and I was thinking ok, maybe the restaurant is going to decorate mum's dessert plate extra nice with a candle or something...but no. They went a notch further! Every staff we encountered while walking in and moving around was congratulating "Happy Birthday, Susan". Granted we didn't know them but this unparalleled customer service demands my glorious salutation. Mum was first surprised and then basked in the glow of all that attention. Towards the end of the night, she even got a birthday card signed by all the wait staff! Food-wise, I'm never disappointed. Everything was perfect, from the dishes to presentation, to timing of the delivery, re-filling of rolls and water, dessert, and finally palate cleansers. Herb Basted Cod with summer vegetable "tart", herbed cous cous salad, tomato vinaigrette. Cous cous was a tad dry for me but it mopped up the sauce well. Cod had a nice crust on the outside and fish was tender. Slow-roasted pork on a bed of roasted mushrooms and asparagus-perfectly cooked and tender despite the thickness. My usual goat cheese, cheesecake dessert. Goat cheesecake with huckleberry ice cream-Tart and creamy, not cloying at all. Lace cookie provided just the right amount of crunch. Seriously, How thoughtful was this? Listen up other restaurants! I'm thinking of getting some items for my supper club. Thoughts? 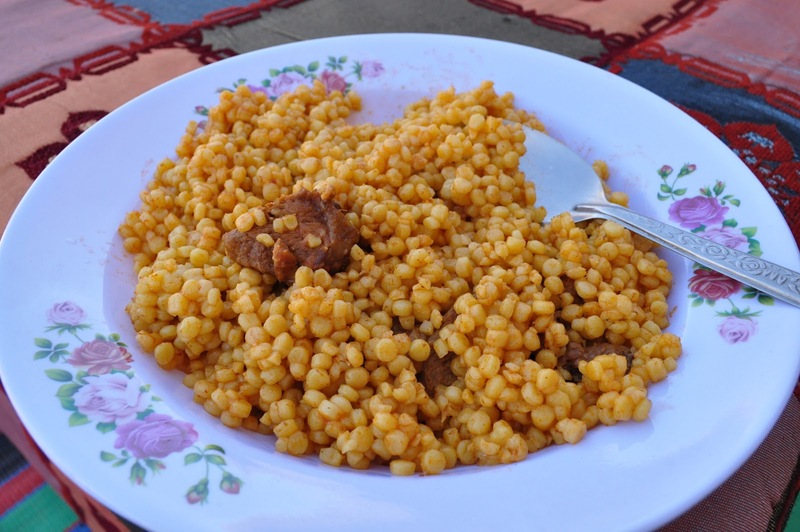 Berkoukes or pasta bullets are a traditional staple in Algeria. They are made using the same process as cous cous, except in a larger size. Taste-wise, it's like pasta, except chewier... and I'm all for chewy foods! Boba pearls give me the same level of satisfaction, I might add. I was introduced to this dish when I was in Tomboctou (Timbuktu). In the picture above, the berkoukes were cooked before being tossed in tomato-based sauce (the only similar taste I can relate to is ketchup) and mutton. I am guessing the mutton had been simmering for some time, hence the meat was tender and not at all tough. Anyone besides me thinks that "pasta bullets" sound cute? Where can we get some Berkoukes?! An alternative that's more readily available and no less yummy would be Les Moulins Mahjoub Couscous M'hamsa Tunsia nom! Turner Fisheries Restaurant Week Lunch, Summer 2011-Great Value! My mum was in town to visit and the first place we went to for lunch was Turner fisheries. I thought our lunch was light and satisfying and the 2 course menu (for $15) was such great value. For my dessert, I chose to order from the regular menu and was really pleased with it because it turned out to be my favorite course. Service was so-so, we were pretty much the only ones there and while pleasant, servers weren't that attentive and were distracting while chatting within earshot. Dark Chocolate Dome with raspberry dust-My favorite of the meal. Beautiful presentation and the chocolate-raspberry combination's a winner. Chocolate was not too rich or cloying and was pretty appetizing. The raspberry dust on the top made it look very pretty. Finally a Reservation at No. 9 Park for Restaurant Week Summer 2011! Food: 6.9/10--> I decided to update my grading scale. After seasons of procrastinating, we finally got a reservation for 7 to No. 9 Park thanks to B! We opted for the 3-course RW menu and supplemented our meal with the restaurant's famed prune-stuffed gnocchi with foie gras (+ $~7 for 1.5 gnocchi). In general, while the food was simple and solid although i felt that the dishes could have been a little more creative and not so typical (even for desserts). For example, angel food cake sounds mundane enough, so I expected more pizzazz even in terms of presentation. Cheese plates were good. Another thing that struck our group of savvy oenophiles, and I quote my friend Tish, "serving us the partial frozen sparkling saumur just really cast a shadow on me". -->Science bit: as water freezes, it pushes out the carbon dioxide. The bubbly, now suspended in air, rushes out as the cork is popped, and you get a flat sparkling... aka wine. After all the hype surrounding chef Barbara Lynch's famed establishment, I must say that the food does not live up to it's reputation for me although I did find it pleasant enough. Smoked Salmon Rilletes: pickled beets, crème fraiche, petit greens-liked the pickled beets and crunchy texture of fried scallion/onion bits. Prune Stuffed Gnocchi: foie gras, toasted almonds, Vin Santo-the texture of silken, fatty foie gras is so luxurious. I never thought of using prunes in pasta but this totally works. Native Bluefish: fennel, garlic, tomato escabeche-I was wondering of the blooms on top of my fish were broccoli flowers...Tomato escabeche imparted a nice pop of acidity to the fish which was cooked well. Cheese plate No. 1-Smoked gouda, triple creme. nom! Cheese Plate No. 2- tomme and comte. loved the salty bite of the comte! I would love it so if they did come! Willing victim of a food attack. Wow, anyone remember the attack of the killer tomatoes? Seen on the signboard overlooking the masspike. Service: 3.6/5.0-Good and friendly in the beginning, then cold and awkward at the end when our server realized that we came with a groupon, even though we over-tipped on the full price. She ignored us when we left and begrudgingly replied when we thanked her for the meal. It seems that when restaurants offer discount deals, they offer discounts on good service as well. Iffy service aside, the food at DOTB was simply sublime. It's less price-y than the North end Italian joints and the portions were fresh and generous. The fresh fusili pasta made in-house was bouncy soft but al dente so texture-wise, I found it pleasantly refreshing. In addition, the seafood's cooked perfectly and the sauces were so so intensely flavorful. The reviews on Yelp are glowing and I wholeheartedly agree. Just don't use your groupons here and your overall dining experience will be perfect. Pan fried calamari with hot cherry peppers-Juicy and tender squid, with the best hot peppers I've had with calamari. The acidity paired so well with the squid and gave it a cheery brightness. Seafood Alexia-Shrimp, scallops, and lobster meat in a white wine garlic cream sauce wth fussili pasta. This was my entree and it is insanely amazing! I would go back and order the same thing all over again. Mussels Yano-Mussels sautéed with onions in either a scampi sauce served over linguine. So succulent and I've never seen so many mussels overcrowding a plate for $17. Limoncello Truffle Ice Cream-Breakout dessert. Let's face it. You know I'm a tad snooty with my desserts and unless it's Cafe Pompi's tiramisu, chances are tiramisu, panna cotta, bombas aren't my thing. This limoncello truffle ice-cream is in a league of it's own. Hands down, the best dessert I've tasted in all the Italian restaurants I've been to in Boston and it costs only $5. The ice-cream (felt like a cross between sorbet and gelato) was dense and had an aromatic bouquet of sweet lemons, and was just sweet and tart enough. At the center, there was an intense, semi-liquid-ey core of limoncello which oozes out slowly and coats the already unforgettable crust. Flava explosion. Note: I have a tendency to procrastinate on writing time-sensitive posts which end up being irrelevant after the time window passes, so this upcoming Boston Restaurant Week presents a good opportunity to revive expired posts from the back burner! I'll start this revival by sharing what I ate for spring RW 2011. Plantain gnocchi-black bean, avocado, roasted red pepper, portobello mushroom confit, shishito pepper, cilantro sprouts-soft and pillow-y with a thin crispy crust, this was really interesting to savor. That Grapefruit Thing. Warm madeleine cake topped with wedges of grapefruit and a toasted white wine sabayon-OMG. It was hard to settle on something non-chocolate-y, but this sounded too interesting to pass up. I'm a fan of grapefruit but I've never had it done this way and it tasted out of this world. It wasn't just a slice of bittersweet citrus and some sweet sauce. I kept taking bites and trying to break the flavor down into individual layers because I was so surprised that three ingredients were all it took to give this dessert such an intriguing taste profile. Profiteroles with Cardamom-Orange Blossom Pastry Cream and Chocolate Ganache-this was good but the chocolate overpowered the orange blossom and cardamom. There are some desserts I almost never order in restaurants for lack of effort and interest and the list includes panna cotta, creme brulee and profiteroles because they are desserts I find I can recreate easily at home. Unless the flavors are totally unique. Then maybe. I'm always at Radius for every restaurant week without fail (See here) since it's pretty much the only time I can afford dining there.The Rw menu lineup in the spring did not disappoint. Beautiful decor, impeccable service, artfully-arranged dishes and adorable amuse bouches and palate cleansers. I have waxed lyrical about this place tonnes of times so I'm going to keep it simple now. Just. Go. Btw, every single course was spectacular. Easiest post ever. Herb Basted Local cod-truffled pommes puree, wild mushroom, red wine sauce, fine herbs-Too good. cod+mushrooms+truffles=umami, meaty flavor. icecream, lace cookies, ginger soup-this was good but not great. Ginger soup thinned and made the ice-cream watery and dilute. Bittersweet chocolate tart-raspberry sauce, chantilly cream-tartness of raspberry cut through the richness of the cake. Very smooth and lux. Nom! Goat Cheese And Huckleberry Cheesecake– huckleberry ice cream, buckwheat tuille, tart lemon syrup-I ordered this and I have never been disappointed with a goat cheese chesse cake. Seriously, goat cheese adds a natural layer of complexity to regular cheese cake and the salty tang nullifies the richness of the dessert. Problem solved. Taste buds not saturated. Everyone's a winner. Palate finishers at the end. Ginger jelly, biscotti and coconut balls.